Recipe given from my good friend Jackie. This is the stuff breakfast dreams are made of. Recipe doubles beautifully to make two loaves (one for a gift and one for yourself). I've also substituted with gluten free flour and it works just as well if only a little bit softer. 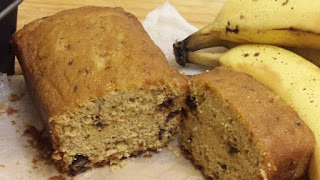 The best banana bread EVER!! - with choc chunks. Super moist! 125g butter (1 stick) - chopped and at room temp. 3 mashed bananas - the blacker the better! Grease 4 mini loaf tins (for best results) or an average sized loaf tin. Line with baking parchment. Put all ingredients in a bowl (except chocolate) and mix on medium speed till has changed colour and gotten lighter (about a minute or so). Fold in chopped chocolate. Spoon into prepared pan(s) and bake 30 mins for small or 40 mins for large - or till golden and pops back when touched on top.